Is it a bird? Is it a bee? No, it's a.... moth! This moth has many names. 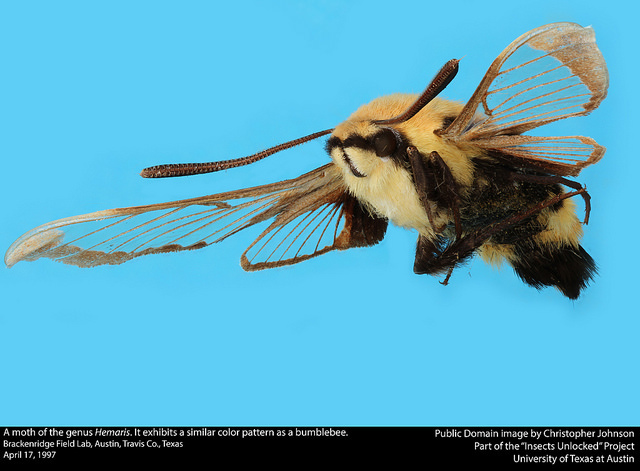 Because its fuzzy amber yellow and black body resembles a bumble bee, it is called a bee moth, bumblebee moth, or bee hawk moth. Unlike other moths, you can see through its wings, so sometimes they are called clearwing moths. Finally, because they are active during the day, because of their size, and because they hover around flowers sipping nectar, members of their family are also called hummingbird moths. As is usual for the Family Sphingidae, bee moth larvae (caterpillars) have a pointy "horn" or spike at the end of their abdomens and are called hornworms. This short video shows a bee moth caterpillar feeding. Can you see its brownish thorn-like horn? The caterpillars eat various shrubs, such as snowberry, or some small trees like cherry trees. Once mature, larvae drop to the ground to pupate in the leaf litter before transforming into an adult moth. The adults feed on nectar from flowers. They seem to be particularly attracted to bee balm (Monarda). And don't forget, it's National Moth Week. Have you ever seen a bee moth? What did you think it was?